Your account will be activated on the chosen date and time. *This question is required. Settings > My Account > Profile *This question is required. This will be used to validate your location. *This question is required. 1. 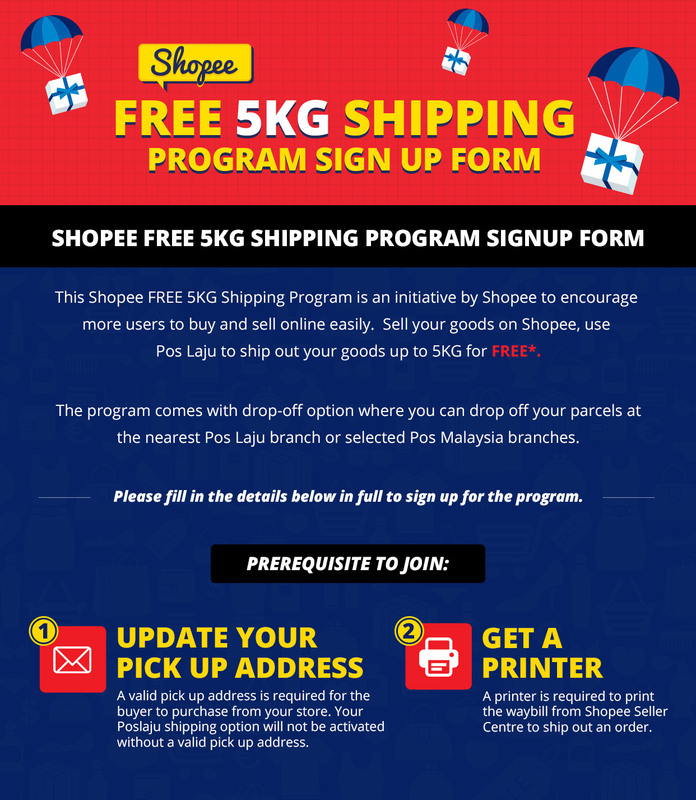 You will receive an in app notification if you are selected for the Free 5kg shipping program. 2. Information keyed into the form must be valid and accurate in order for your account to be activated on the chosen day. 3. Free Shipping for an order is capped at a maximum of 5KG for deliveries to West Malaysia, and 1KG for deliveries to East Malaysia. 4. Minimum spend to qualify for free shipping for an order may be subjected to change. 5. No upfront payment required when you ship an order with Pos Laju using Shopee’s self-printed waybill. Shopee pays for you. 6. Only drop off option is available. 8. Shipping fee will be charged based on the actual or volumetric weight, whichever is higher. Seller will be liable for any wrong input of weight which exceeds the cap. 9. Shopee reserves the right to terminate the program at any given time with prior notice. 4. Acknowledgement *This question is required. I agree to Shopee's T&Cs and allow Shopee to collect my account information for program activation purposes.